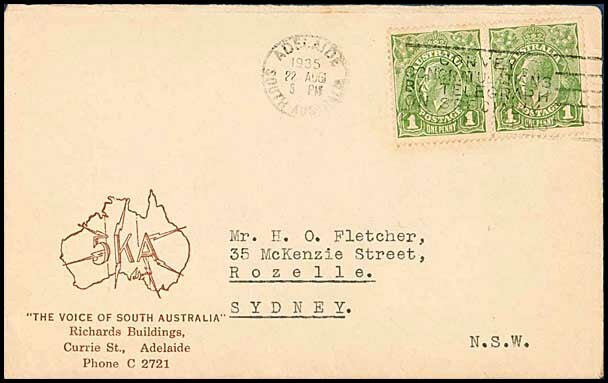 was introduced at main Post Offices except in Western Australia from 26 January 1935. The success of the Christmas Greetings forms and the Sydney Harbour Bridge issue led the PMG to extend the range of the ornamental greetings forms in 1934 to other types of ornamental forms - Mothers' Day, Birthday and Congratulations forms. 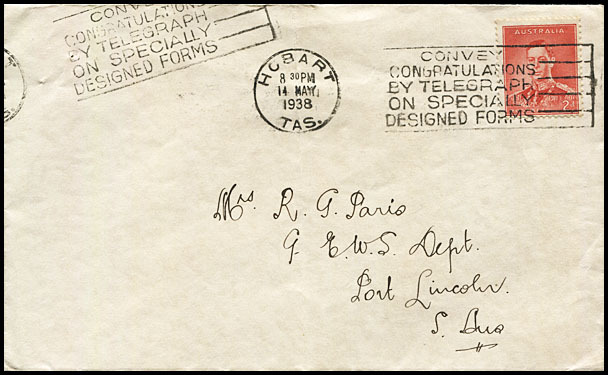 The first Congratulatory Telegram was first issued in May 1934. 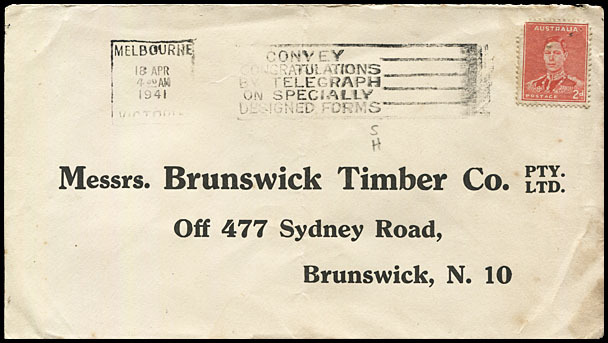 The Convey Congratulations .... slogan was used between 27 November 1934 at Sydney and 10 July 1941 at Adelaide. The slogan was generally withdrawn from use starting in the first half of 1940 although a number of 1941 uses are known. 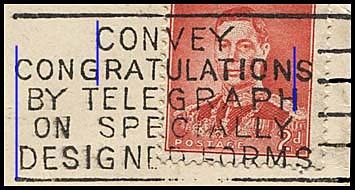 The latest date of use for the 1939 Congratulations Telegram form is 21 December 1940.
the relative positions of the S at the end of the second line and the H at the end of the third line. Lines 2 to 4 starting CBO are nearly aligned at the left. The line starting DES is outdented slightly. The H at the end of line 3 from the space after the N above to about the middle of the S at the end of line 2. Further confirmation is given by the relative positions of other letters in lines 1 and 2 - for example the top of the A of line 2 is just inside the N above. 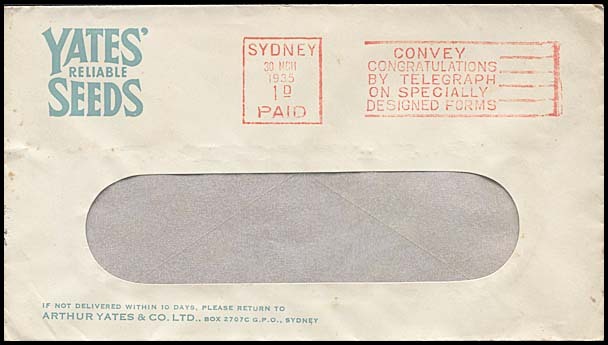 28 November 1934 with Sydney 3 Pillar Box. lines 2 and 3 finish with the S and H level or nearly so (State variations). Further confirmation is given by the relative positions of other letters in lines 1 and 2 - for example the top of the A of line 2 is outside the N above. CONGRATULATIONS is 35 mm long. 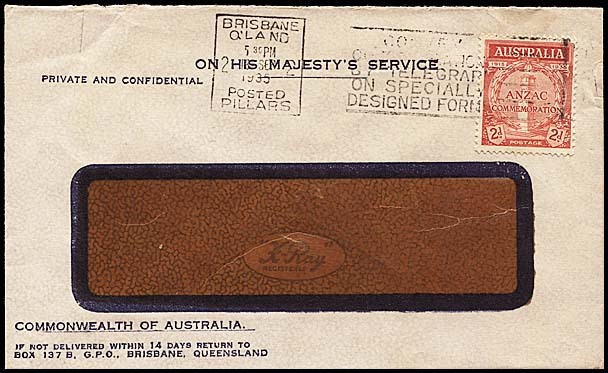 1 July 1939 with a Brisbane 2 IN PILLAR BOX. the line starting ON is indented compared with BY above while the line starting DES is outdented slightly. 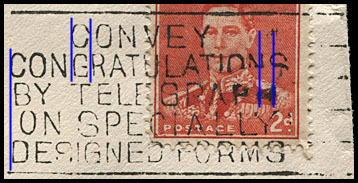 The S at the end of line 2 is often directly above the H at the end of line 3 although in some State variations the H is only partially under the S.
H fully under the S.
11 January 1940 with Adelaide Box 4. H partially under the S.
The H at the end of line 3 spans NS at the end of line 3. CONGRATULATIONS is 34 mm long. 9 July 1941 with Adelaide circle. the 2nd N (of CONGRATULATIONS) is directly above the H at the end of line 3. 22 July 1937 with Sydney Box 1. C (of CONVEY) is placed to the right of the G of CONGRATULATIONS. The 2nd and 3rd lines are indented further than for Die 5 with the ON starting at the middle of the B above. CONGRATULATIONS is 36 mm long. 23 July 1937 with Sydney 1 IN PILLAR BOX. 5 March 1941 (very late usage).